Are you new to canning? It can be intimidating to start out with preserving food. What if you do something wrong? Will you make people sick? How do you can things safely? The techniques that Kathy covers should give you the confidence to make delicious treats from your kitchen, as well as give you fantastic holiday gift ideas! Are you an experienced canner who is having issues with your jelly-making? Jellies that turn out runny and jams that never set properly are so disappointing! Canning delicious jams and fruit butters can be tricky sometimes. 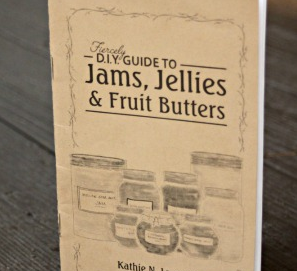 Let Kathie help you troubleshoot your jelly-making techniques! Are you bored of the same old recipes that you make year after year? This lovely little book contains 13 original recipes from Kathie that will inspire you to push your boundaries and help you find new ways to please your palate! Did you know that you can make jelly with coffee or maple syrup? Kathie Lapcevic of Homespun Seasonal Living has released a new book in her “Fiercely D.I.Y.” series that covers a special corner of canning and preserving. The Fiercely D.I.Y. Guide to Jams, Jellies, & Fruit Butters covers techniques, recipes and tips to help you make better fruit preserves. The book is now available in both a softcover book as well as an ebook that you can download instantly. Normally priced at $7.50, you can pre-order the printed booklet for $5.00 with first class shipping to the United States if you order during February 2017! Use the code febjam to save!